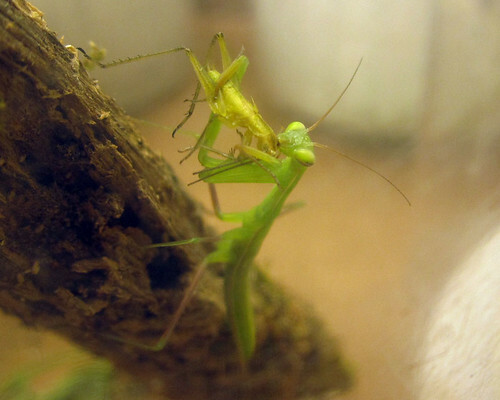 A young praying mantis, keeping me company in the lab, snacking on a little katydid. Posted on July 13, 2011, in Invertebrates, Mantidae. Bookmark the permalink. 7 Comments. That’s awesome! I have just started spotting them across the street from where I live. Are they easy to raise? As long as they have an appetite, they’re quite easy to keep! Stick with herbivorous prey such as grasshoppers and plant bugs, or buy crickets from the store. The cage just needs a few branches for them to cling to, and a bit of foliage to feel secure. I could read a book about this without finding such real-world appocarhes!